9.30 to 18.00 (Monday to Saturday). Last entry is 1 hour prior to closing time. 10.00 to 18.30 (Monday to Saturday). Last entrance is 15 minutes prior to closing time. The museum will close 1 hour before kick off on match days and will not re-open after the match. Stadium tours operate all year round. Avoid visiting during the European League when there are likely to be interruptions to the opening hours. We are comparing Emirates Arsenal Stadium Tour and Museum Tickets Prices from leading ticket suppliers and Try to find you Cheap tickets prices on the market. Fully renovated and reopened in 2006 the Arsenal Museum tells the story of its leading football team from its foundation in 1886 to the present day. Inside you will find two video theatres as well as historic items belonging to the players of the club. Items on display include the original gloves worn by goalkeeper Jens Lehmann, the shirt worn in the final of the FA Cup in 1971 by Charlie George, and football boots belonging to Michel Thomas. The highlight of this combo ticket is access to the Emirates Stadium where you can use an audio guide to learn about the arena and its players-only sections or visit with an expert guide. Aimed at football fans this is a fantastic combo experience for Arsenal supporters and anyone interested in the team's history. A great way to learn about the team and get behind the scenes in the stadium. Perfect for Arsenal fans who have reserved match tickets for the same (or subsequent) day, you can plan to visit the museum before the match. This attraction is suitable for guests of all ages and great for kids. Your Experience With Emirates Arsenal Stadium Tour and Museum Tickets? 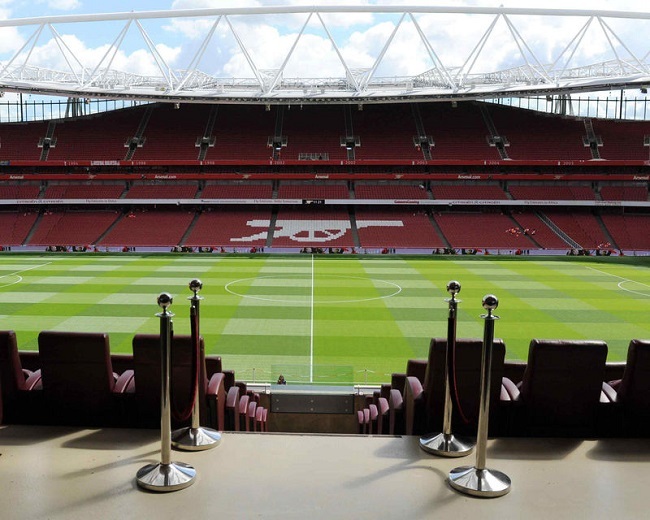 Take a guided or self-guided tour of the Emirates Stadium at a time of your choosing. Get behind the scenes with access to the players changing rooms, the players tunnel, the Director’s box and the dugout area. Learn about the history of Arsenal football club and its legendary players in the onsite museum. Use your free audio guide to explore the site. View the highlights of Arsenals memorabilia and get interactive in the two video theatres. What Emirates Arsenal Stadium Tour and Museum Tickets Includes? Visit to the Emirates Football Stadium. Admissions ticket to the Arsenal Museum. Multilingual audio guide (available in English, French, Italian, Portuguese, Spanish, German, Dutch, Japanese, and Chinese) or live English-speaking guide. The stadium will be closed on match days, therefore, we recommend checking the days of matches at Emirates Stadium online before you visit. Travelers Reviews about Emirates Arsenal Stadium Tour and Museum Tickets? The Emirates Stadium and Arsenal Museum Tour has a reputable overall score of 4.5 out of 5 from over 1,000 travellers reviews on TripAdvisor. Reviews are even more positive from Get Your Guide users who have given it a whopping 4.8 out of 5, while Viator users indicate that this is a perfect excursion by leaving a full 5 out the 5-star rating. Comments generally agree that this is an excellent tour and a brilliant London attraction even if you are not a big Arsenal supporter. Reviews also mention that the Stadium and museum staff are both friendly and polite. People taking the self-guided tour also say that the audio guide is very informative. The Emirates Stadium and Arsenal Museum are accessible to wheelchair users. Email confirmation will be received at or soon after the time of booking. Tickets for this attraction may need to be printed. Cancellation policies depend on the specifications of your individual ticket supplier. Some tickets are specified as non-refundable but some ticket providers will offer full refunds up to the specified number of days in advance. Stadium tours will not operate on match days or from 1 pm a day in advance of the European League. Due to stadium events visitors will not be permitted to enter the player’s tunnel, dugout area, or players changing rooms during the month of May and instead of an audio guide, you will receive a guided tour. Discounts are available for students (you must show a valid student ID at the entrance. Match tickets are not included in the ticket price. Meeting Point: use the entrance on Queensland Road, at the Armoury Store area. Address: Hornsey Road, N7 7AJ, London.